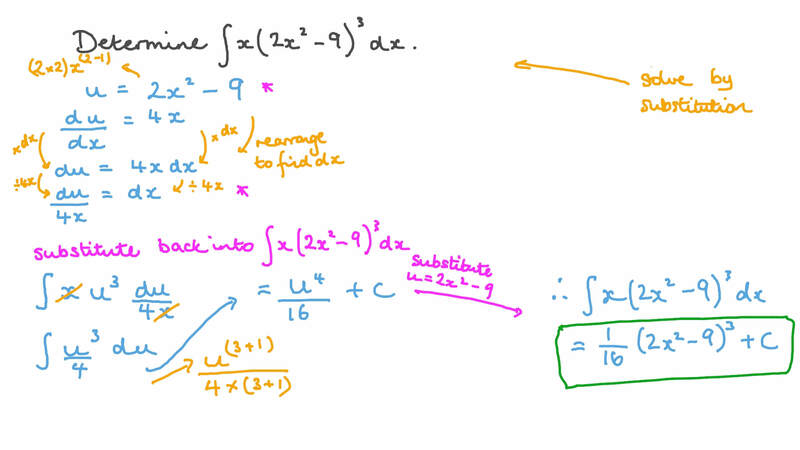 In this lesson, we will learn how to change variables to find the antiderivative of a function and evaluate the indefinite integral for that function. Determine  𝑥  2 𝑥 − 9  𝑥 2 3 d .
Determine  𝑥  𝑥 + 9  𝑥 5 6 7 d .
Determine  8 𝑥 ( 8 𝑥 + 9 ) 𝑥 2 d by using the substitution method. 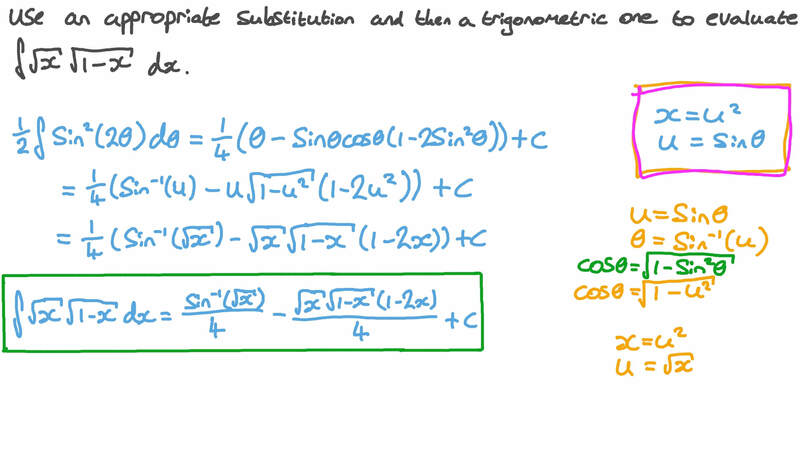 Determine  − 2 𝑥 ( 𝑥 + 8 ) 𝑥 2 d .
Use an appropriate substitution and then a trigonometric one to evaluate  √ 𝑥 √ 1 − 𝑥 𝑥 d .
Determine    − 2 4 𝑥 + 3 0 6 𝑥   − 6 𝑥 − 5 6 𝑥   𝑥 3 4 5 s i n c o s d .
Determine  − 1 1 6 𝑥 √ 𝑥 𝑥 3 l n d .
Determine  − 4 9 𝑥 ( 9 𝑥 ) 𝑥 l n d 7 by using the substitution method. Determine  − 2 𝑥 − 1 5 2 𝑥 + 5 𝑥 t a n t a n d .
Determine   ( 6 2 𝑥 − 2 2 𝑥 )  1 2 2 𝑥 − 4 2 𝑥   𝑥 s i n t a n c o s s e c d 5 2 . Determine  4 7  7 𝑥 5 + 1  𝑥 s e c d 2 . Determine  5 7 𝑥 𝑥 s e c d .
Determine   9 𝑥 2 − 2 2 𝑥 + 8   9 2 𝑥 2 − 4 2 𝑥  𝑥 s i n t a n c o s s e c d 3 2 . Determine  9 𝑥 𝑥 5 𝑥 − 1 9 𝑥 t a n s e c s e c d .
Determine  2 7 𝑥 𝑥 c s c d .
Determine  − 7 3 𝑥 5 3 𝑥 𝑥 s e c t a n d 2 . Determine  4 1 8 𝑥 + 8 9 𝑥 9 𝑥 + 2 9 𝑥 + 5 𝑥 s i n c o s s i n s i n d 2 . Determine  4 + 5 𝑥 4 𝑥 + 5 ( 8 𝑥 ) 𝑥 t a n l n s e c d .
Determine  ( 7 − 9 9 𝑥 ) 𝑒 𝑥 s i n d (      ) c o s .
Determine  − 8 4 𝑥 2 4 𝑥 − 5 𝑥 c o s s i n d .
Determine  𝑥 √ 4 𝑥 − 1 9 𝑥 7 d .
Determine  ( 1 2 𝑥 − 3 ) √ 4 𝑥 − 1 𝑥 8 d .
Using proper substitution, find   √ 𝑥 − 2 4 𝑥 𝑥 d .
Determine  𝑥 √ 6 𝑥 + 7 𝑥 6 d .
Determine  𝑥 √ 5 𝑥 + 9 𝑥 2 d .